As, I completed my parayan last Thursday, my driver called to inform me that there is a Baba temple , about 5-6 kms from our house. ( I live in a villa in a gated community, in the outskirts of Bangalore). I was overjoyed and asked him to take me there that evening itself. As I neared the temple built in a village, I noticed that it was a small Baba mandir. I entered the temple and asked the pujari ji about the schedule of the Arathi, to which he told me the timings and introduced me to a noble lady Usha Amma who was the one in whose farm the temple was built. The temple was built by Usha Amma‘s Husband in their farm land. They have not taken a single pie donation for building this temple or maintaining it. I was awestruck when Amma took me around the temple and explained everything to me . Another astonishing fact was that there was an ‘Oudambara’ tree, which had come up by itself about 12 years back, in front of the temple. 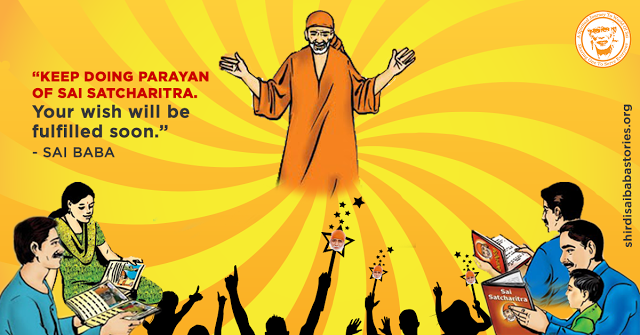 It is believed that, Guru Dattatreya, lives in Oudumbara tree and Baba is an incarnate avatar of Dattatreya. They also have a Gurusthan being built and also a holy lamp burning in a small Dwarakamayee replica. Amma took me around personally and showed me around the temple. By the grace of Baba, I requested Amma that I should be allowed to serve the prasadam in the temple every Thursday and she happily consented to that. I look forward to serve the prasadam starting from Two weeks from now. < br/>By the grace of Baba, my wish of serving the prasadam is fulfilled. I hope and pray to Baba, that He gives me the strength to serve the prasadam till my last breath. I am also confident, that Baba will also fulfil my wish of hosting bhajan sessions in my house . If the grace of Baba is there, one day, I also want to write the ‘Sthala mahatma ‘ (Place Importance) of this place and how this temple was built. I take this opportunity, to thank the organisers of Mahaparayan for getting me to be a part of this Godly service . I humbly submit myself and my family at the holy feet of Shree Shirdi Sai Baba Akhilanda Koti Bhramanda Nayaka Rajadiraja Yogiraja Parabrahma Sai Nath Maharaj Ki Jai. Everything and anything that plays in our lives is only and only His Leela, His master plans are beyond human intellect. So the best that we can do is surrender with complete faith and bow our head on His feet and be rest assured that He like a mother will carry His children in His arms. None can equal His motherly love, care and concern for His children’s physical, intellectual and spiritual upliftment. Love You Sai. Jai Jai Ho Sai.